Rep. Wes Gatchalian (Valenzuela City) in a photo posted on his Facebook account. A photo which made rounds on Facebook earlier this month shows the vehicle of Rep. Wes Gatchalian (Valenzuela City) blocking the ramp made for disabled persons in front of a restaurant in Quezon City. 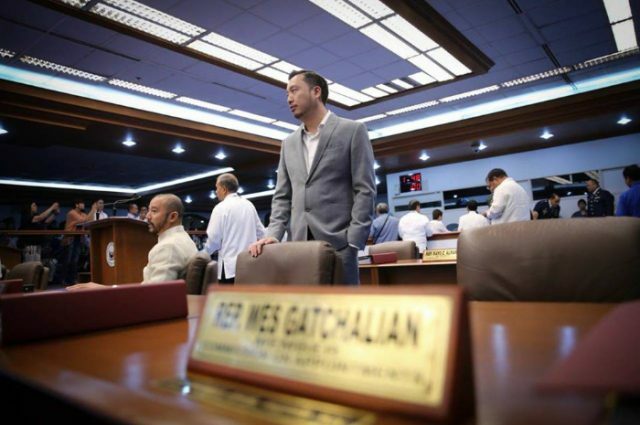 Gatchalian, brother of Sen. Sherwin Gatchalian, had since apologized for the incident, saying that he had already suspended the staff responsible for it. Facebook user Arlene Escalante was the one who shared the photo, which she said she did not take herself. In it, a Ford car is parked in front of a branch of North Park restaurant along Mindanao Avenue in Quezon City. The driver or owner of the car parked the car in the spot that gets in the way of the ramp specifically made for the PWDs. Escalante expressed her ire in the caption without dropping any names. She only claimed that it was owned by a congressman. “Tama po ba ito, cong? Tagagawa pa man din kayo ng mga batas!” part of her post read. Three days later, Gatchalian made an apology letter and posted it on his official Facebook account. He admitted that he was the congressman being referred to in the post, but was not the one driving it at the time of the incident. Still, he assured the public that he took appropriate measures to make sure the incident will not happen again. “While it was not me who was driving the vehicle, I believe that it was my duty to ensure that my staff constantly acts in a manner that respects and is conscious of the rights of every person. Nothing less should be expected of my office,” Gatchalian wrote. This is the second time this year a public official is tagged in an action perceived offensive to PWDs. In September, blogger Mocha Uson, then a communications assistant secretary, was in hot water for mocking the sign language of the deaf with her co-blogger Drew Olivar. Part of the benefits and privileges given to PWDs are public ramps and cut-out curbs, according to the Implementing Rules and Regulations of the Magna Carta for Disabled Persons. Cut-out curbs and accessible ramps at the sidewalks.